How To Dance The PHUNK! 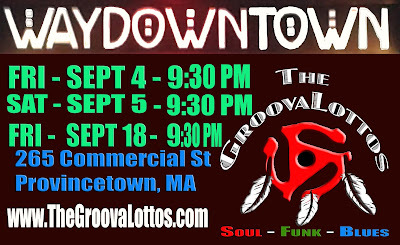 Get Up On The Latest Line Dance!!! 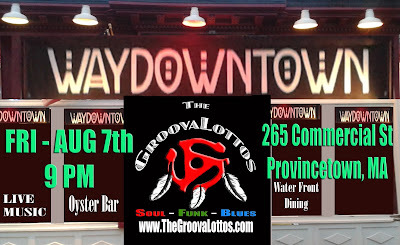 As we prepare for the New Year release of The GroovaLottos new single, here is your chance to learn the line dance The PHUNK in seven easy steps. 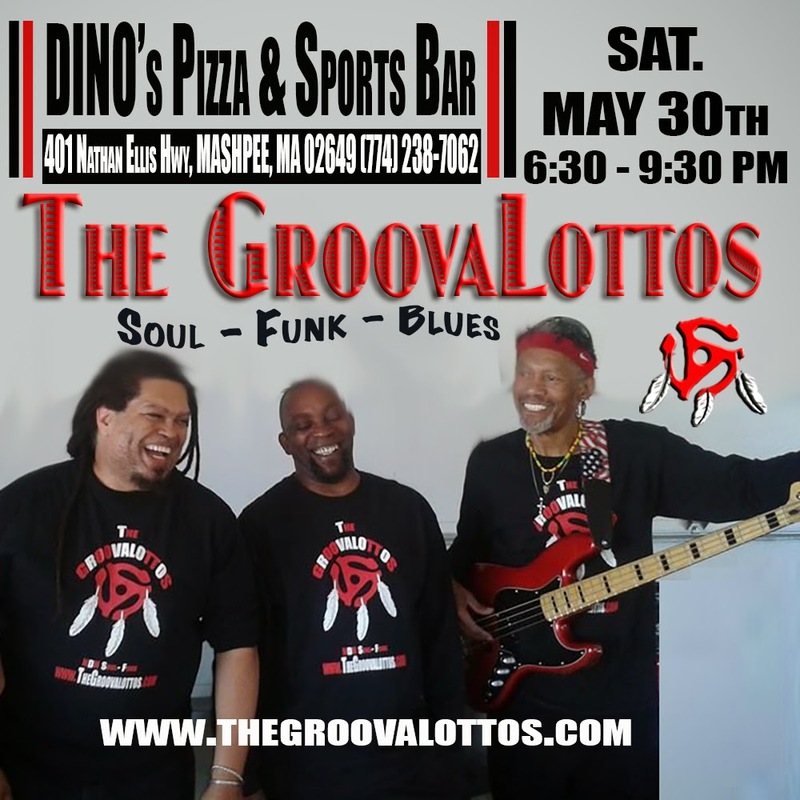 As a GroovaLotto, playing and singing are intertwined. 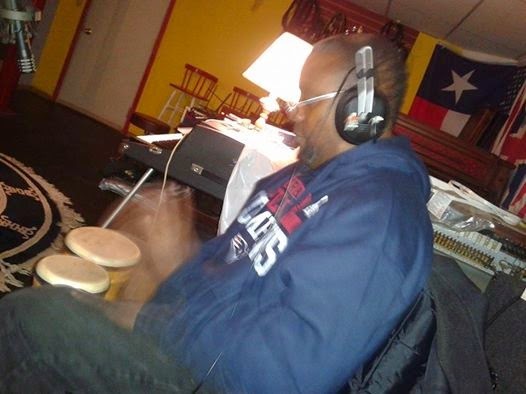 As a producer, I've come to recognize that on all of my projects, the lead vocal comes in three phases: Scratch, the vocal sung while doing the basic tracks; Reference, two takes the the lead that we build the back-up tracks from; Final, which 80% of the time are taken from one of the reference takes, but occasionally I've been inspired to catch a whole new take. Recording the lead vocals for a project can be stressful and for many years it was the most difficult part of recording for me. 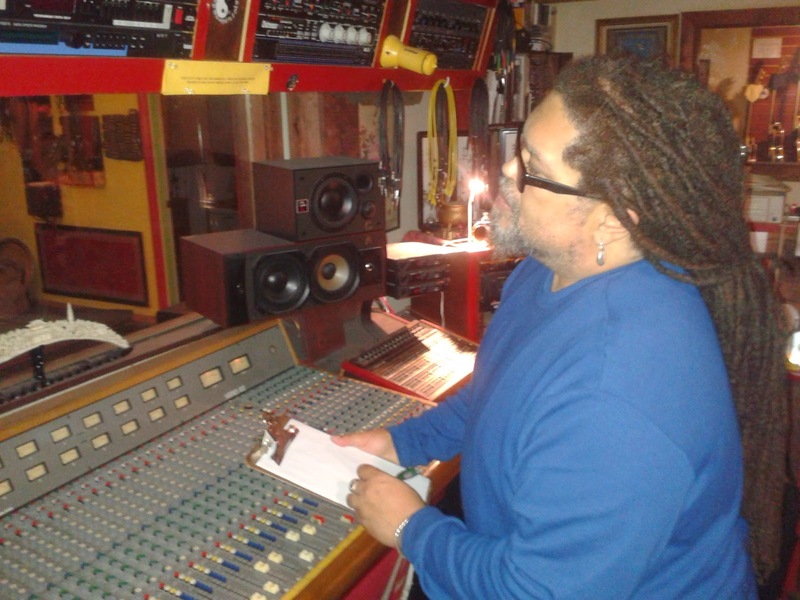 My last several albums were the result of tons of discussions and consultations with studio singers, producers, and my own trials and errors in the studio. I understand from a few friends who worked with him that Prince prefers to record his vocals with no one else in the studio. He gets his engineer to set up a microphone for him and they leave him to his work. Since I used my own studios for my solo projects, it was easy to use the Prince method, but going back into a third-party studio, I had to revisit my old consultations for the vocals on this project. For some reason, after a few passes and re-passes, the vocals were okay, but just not rising to the occasion of the songs. With my previous solo projects, the studio versions and the live version varied greatly because of the differences in personnel. 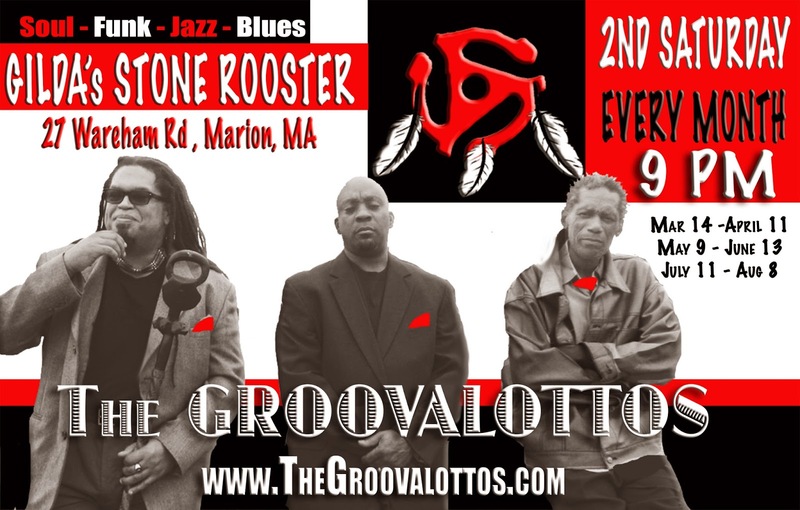 With The GroovaLottos, the project dictated that the album is an 'enhanced' version of what we do live as a trio. So the vocal was a matter of recreating some of the best performances of these songs at our shows. Luckily, I have a habit of filming our shows for archival and evaluation purposes and found several old shows where the versions of the vocal were particularly inspired. 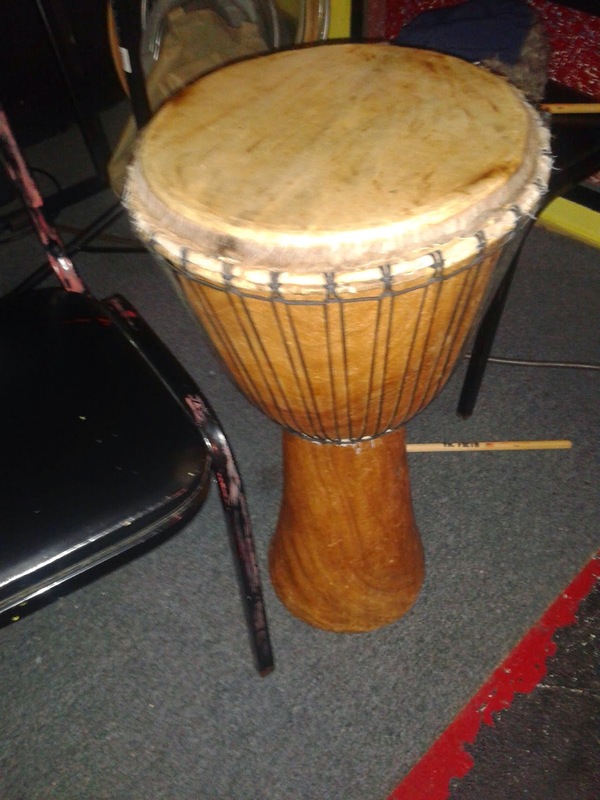 The other key factor that I observed with these performances was that I played while I sang. THAT WAS IT!!! The next time in the studio, we set up my keyboard and did a keyboard pass along with the vocals. Not only did the vocals make the leap, but were spot on in one or two takes and the keyboard part ended up becoming the new main keyboard part as it was also more in the groove with the tracks. Dan, our extremely patient engineer, dumped the leads and basic onto CD for us to listen to over the week. 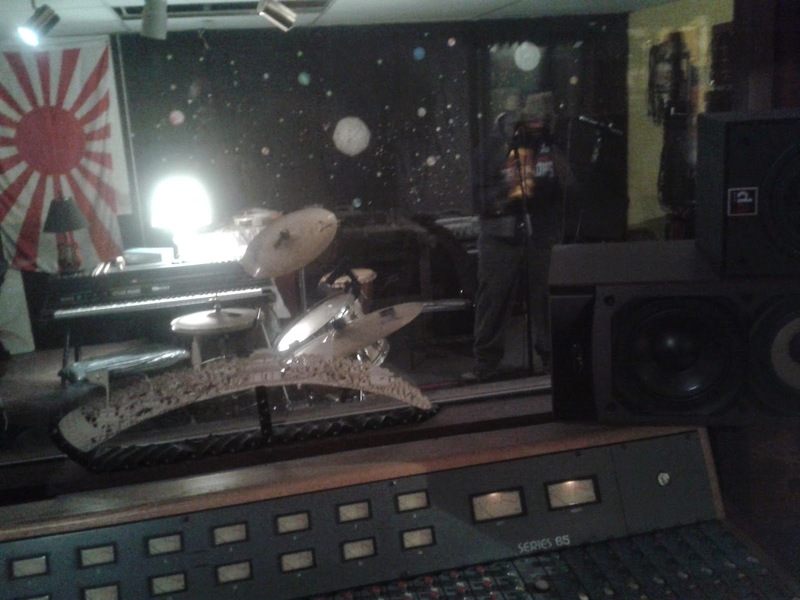 According to my notes, the backing vocals were going to be a combination of horn parts and street-corner doo-wop harmonies, layered under the Sam & Dave, two voice call-and-response stuff that we do live. Eddie Ray and I ended up having a lot of fun crafting the backing vocals for these songs as we gave each voice a character and a name. For example, "Do You Mind.?" has a shared lead by Medium- sized Jimmy and Handsome Al. Then we have The Tennessee Choir Boy and Mel Tourmé, with the Cookie Monster on the low part. When we did a test market on this song, we let the vocal harmonies ride and found that people thought we were a much bigger band until they saw the video. In about three sessions, we have great reference leads and back-ups for all 13 songs. Now on to one of the hardest parts about being in a band, that's like family, and a business. 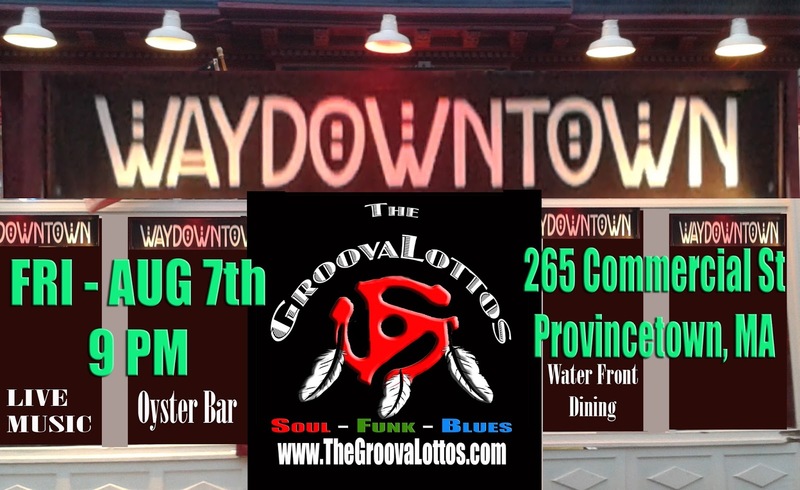 The GroovaLottos Funkin' It Up WayDownTown - 3 Dates!!! 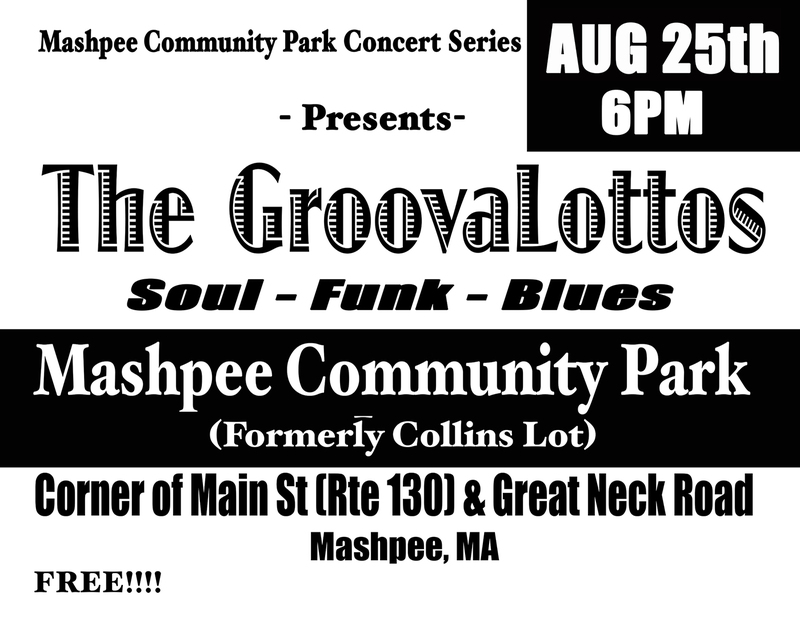 MASHPEE - The GroovaLottos makes a stop in Mashpee Community Park on Tuesday, August 11 at 6PM as part of the Summer Concert Series sponsored by the Arts Foundation of Cape Cod and TD Bank. The concert is free and open to the public, who is encouraged to bring a picnic supper and enjoy the evening. Winners of the 2015 Silver Arrow Award for the Soul Music category, and finishing their first album at MDI Studios, the band has had an active summer of regional touring, with shows throughout the cape, as well as Boston, the South Coast, Rhode Island and Connecticut. 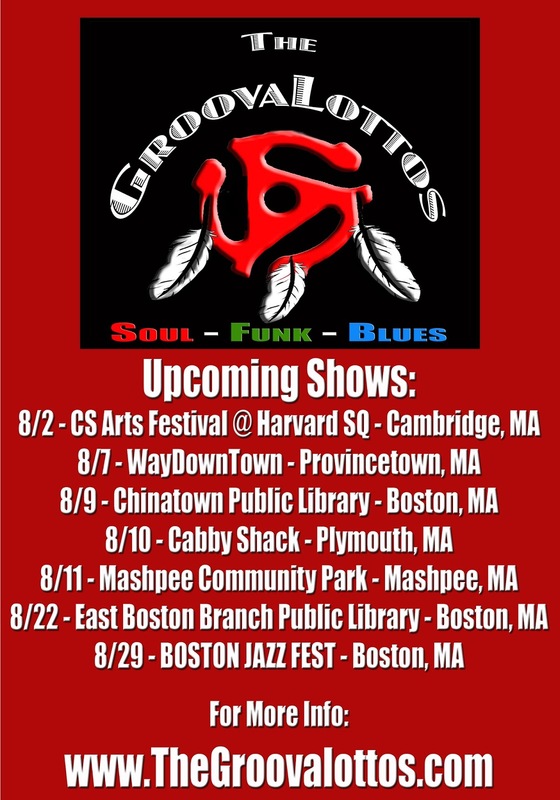 Recently headlining the Onset Beach Jazz Festival and touring with the Cultural Survival Arts Festival, The GroovaLottos will be headlining the Boston Jazz Fest on August 29th along with jazz singers Pat Braxton and Rebbeca Parris. 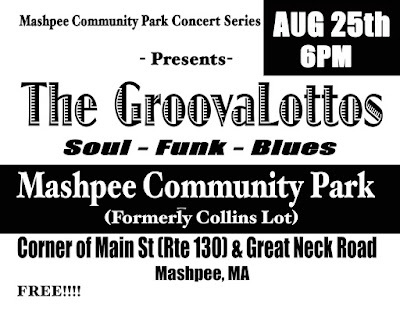 Their July 4th alcohol-free concert and dance drew a diverse audience of people who danced all night to the soul-funk-blues grooves of the band. They are now looking into making the dances a monthly Song Keepers event. 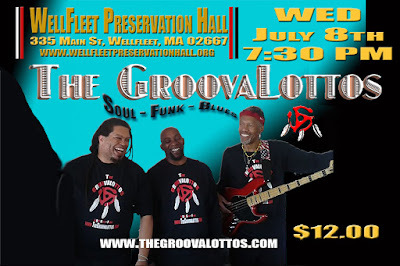 WELLFLEET - July 8th, The GroovaLottos bring their soul-funk-blues party to Wellfleet Preservation Hall, 335 Main St, Wellfleet, MA 02667 (508) 349-1800. 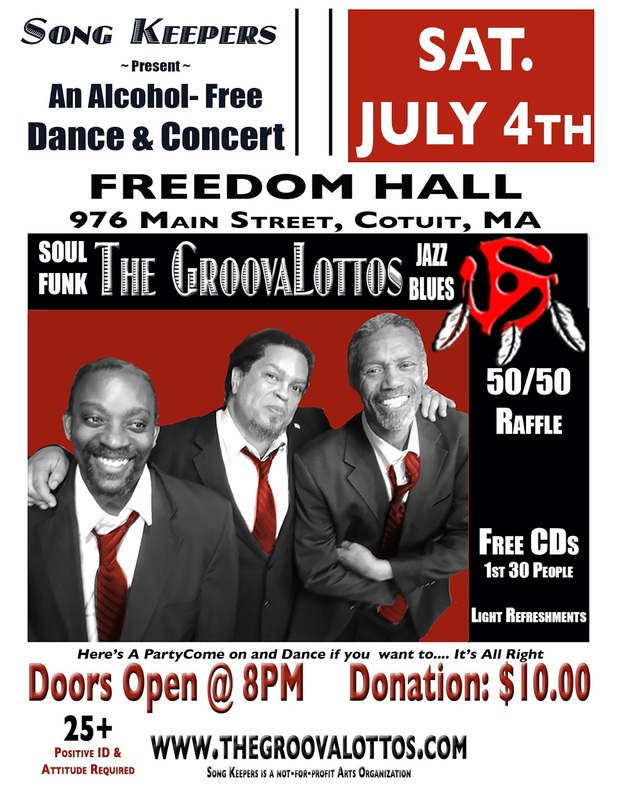 COTUIT - Song Keepers, Ltd., presents the first of their series of Alcohol - Free concerts and dances at Freedom Hall in Cotuit, on Saturday, July 4th at 8PM. 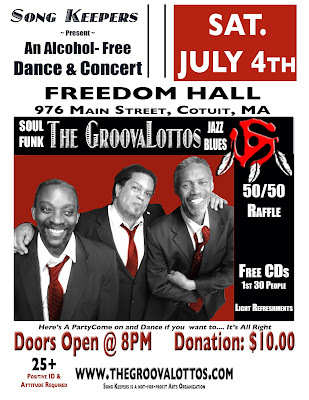 The July 4th celebration will feature dance music by The GroovaLottos. 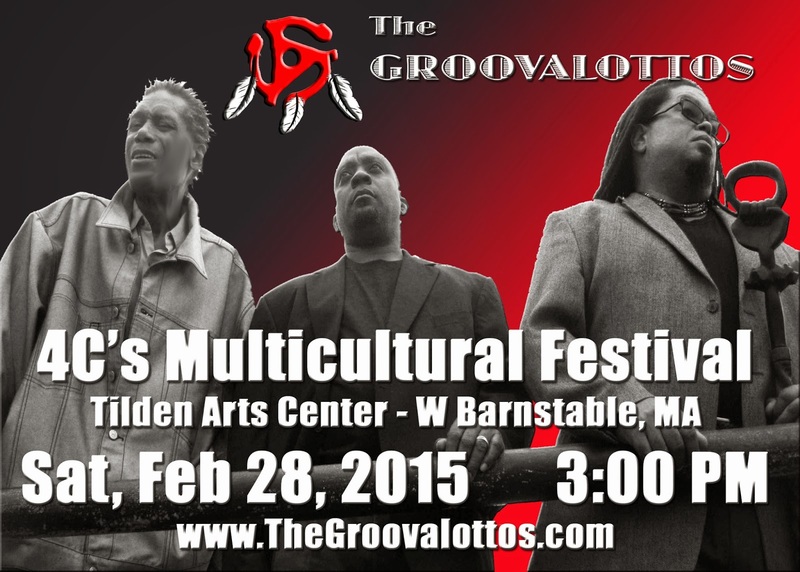 Freedom Hall is located at 976 Main Street in Cotuit and the donation for the event is $10. The first 30 admissions will receive free CDs and there will be a 50/50 raffle as well as refreshments available. 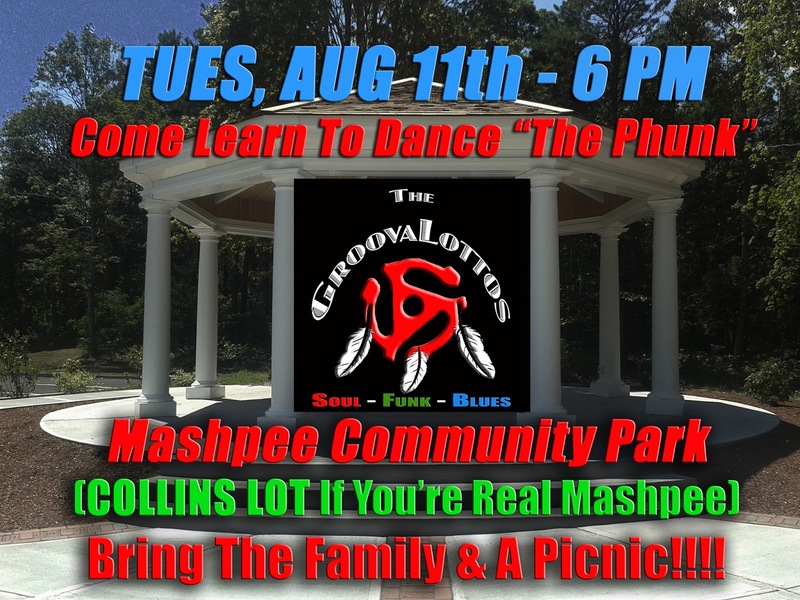 The Concert & Dance will follow the Cotuit 4th of July parade as well as the 94th Annual Mashpee Wampanoag Powwow. There are many people on the cape currently in recovery and/or trying to lead clean and sober lives, with little opportunities for adult entertainment outside of bars and nightclubs. 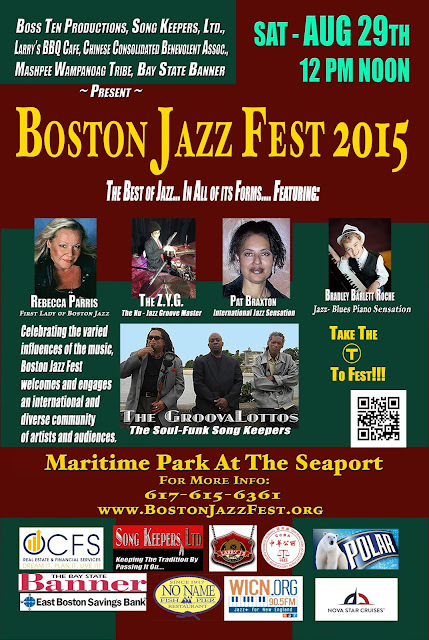 The Song Keepers' events provide a way to party and celebrate a healthy lifestyle. Song Keepers, Ltd. is a newly formed non-profit arts and education organization, dedicated to preserving and continuing the musical traditions of soul, funk and the blues, while providing high quality social and educational experiences for the community at large. Albums always take me a long time to produce. That is to say, I take my time producing them. I'm big on letting tracks season before I go back and adjust or overdub. Once I had the basic tracks on a CD, the CD lives in my car and I'll listen to it throughout the production process. First, I like to get a great take and build from there. As the production evolves the sound and feel might shift slightly, but the basic tracks are always the foundation. 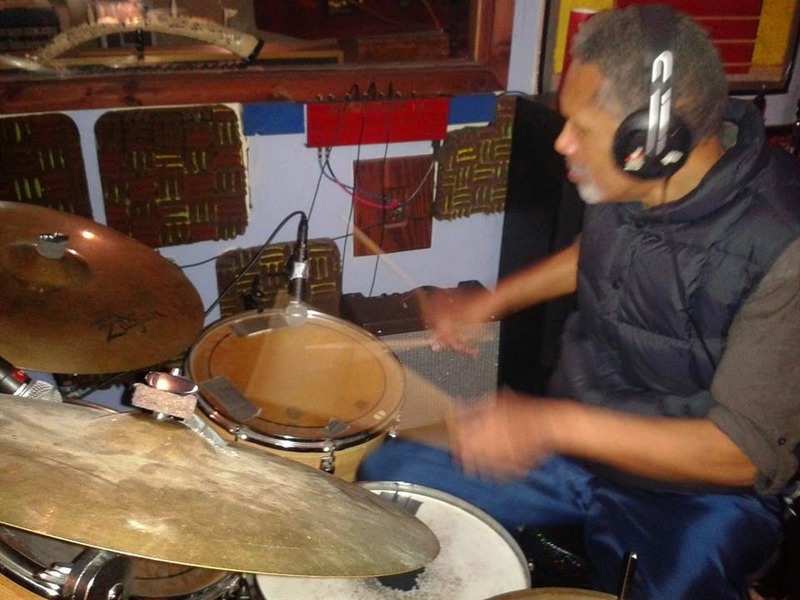 Eddie Ray's drum tracks are about as funky as you can get. 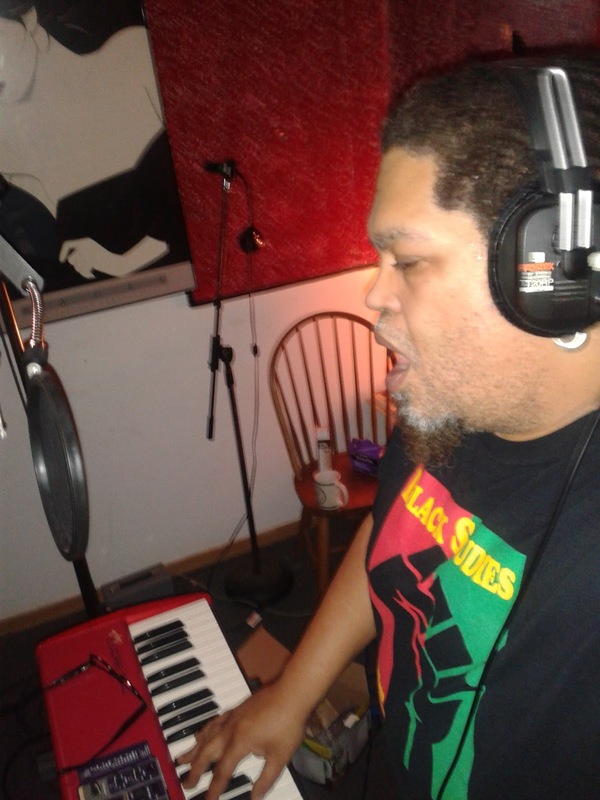 After redoing my keyboards from the original scratch track, it was time to bring in Redbone and do the bass lines. 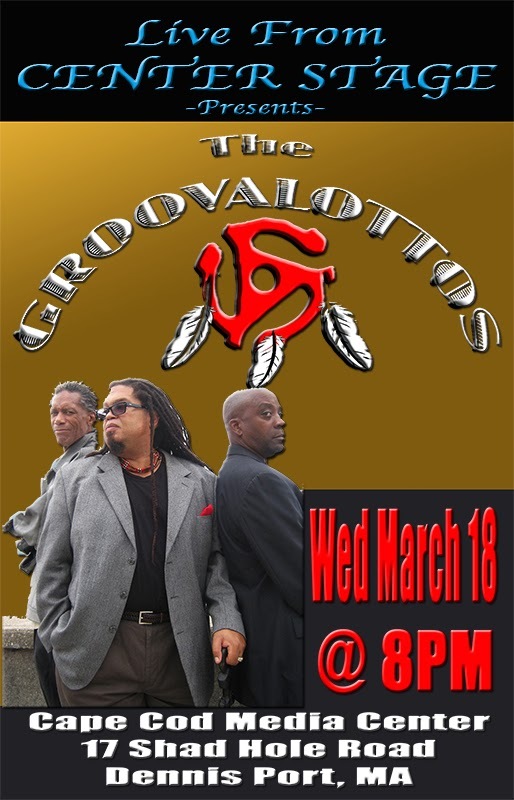 Redbone and Eddie Ray have been playing together for years, having been in the legendary band, West Side Soul together in the 1990's, they are a bass an drum unit. 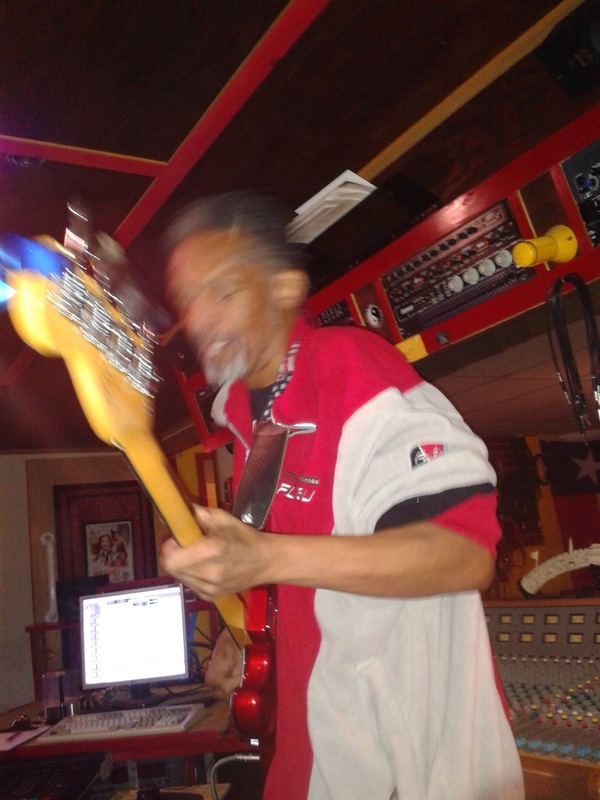 Listening to the basic tracks and then listening to other records with great, funky bass and drums I began to get ideas that would lift our sound into a new paradigm rhythmically. 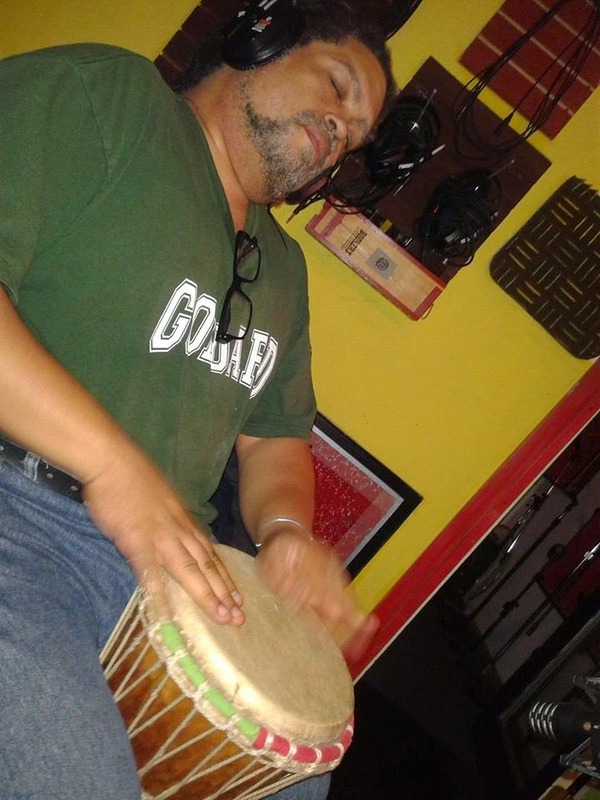 My sensibilities had been colored with the work of great jazz musicians playing on soul and funk records as well as the 1990's era of hip-hop where producers like Pete Rock, Ali Shahid Muhammad, DJ Mark the 45 King, and DJ Premiere created some remarkable sounds from their sampling and looping work, juxtaposing swing beats against straight time beats. Ironically, virtuoso jazz players and untrained DJs turned producers have similar ears and concepts that escape conventional concepts of how music should be performed. Producers notes on playback. As usual, Redbone nailed it. Listening, for example, to the bass and drum work of James Jamerson and Benny Benjamin of the Funk Brothers/ Motown studio band of the 1960's. 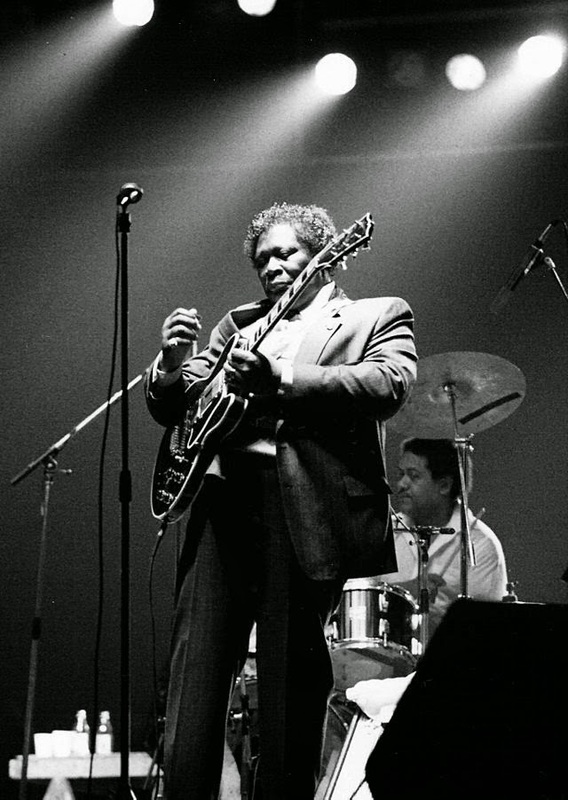 On several records, like "Hitch-Hike" "This Old Heart of Mine" and "Baby I Need Your Loving", you can hear the bass and drums are rocking two different time signatures against each other; giving the songs their edge. In the movie "Get On Up" we see a depiction of James Brown brow beating his musicians when they question his mixing of time signatures on the song "Cold Sweat". 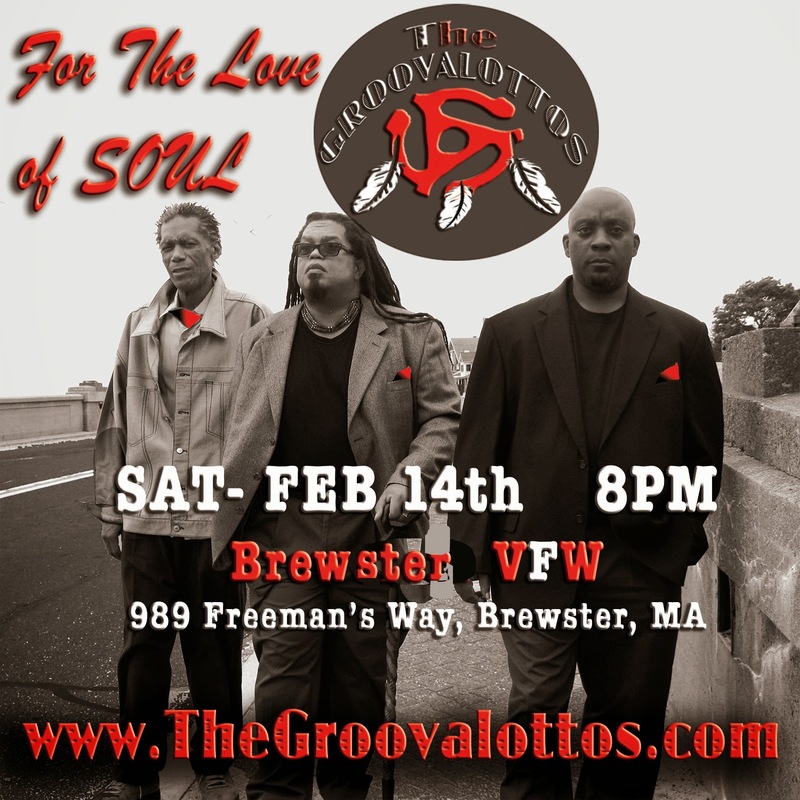 In this scene, we see Brown encouraging his musicians to the ink of their instruments as drums, similar to the philosophy that Eddie Ray brings to The Groovalottos, grooving is a counting game. Redbone is a natural born talent and genius of the bass; being self taught on the instrument and growing up singing doo-wop on the street corner as a kid. From the first time that he came to a band rehearsal, it was clear that he understood and felt the groove and could make us feel it too. 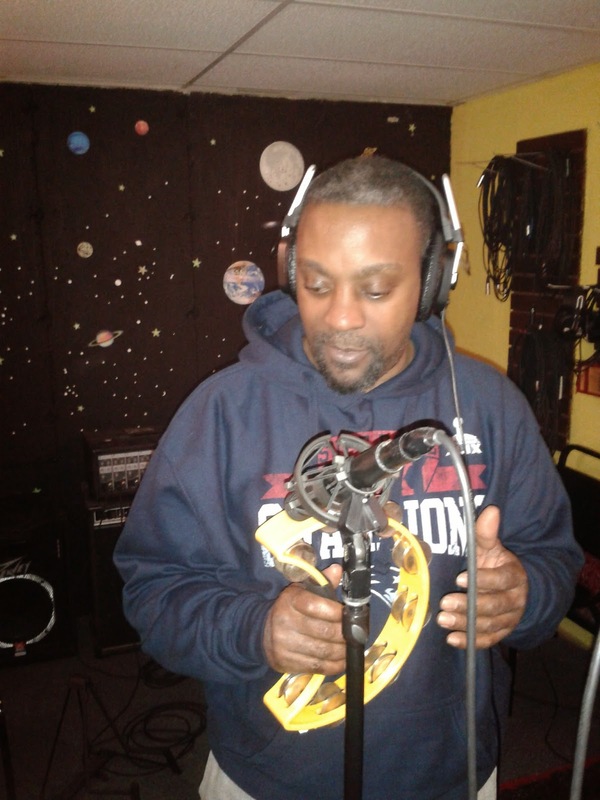 You see, a soul-funk record is about feeling, and the ability to convey that feeling to the listener. I would put him up against most conservatory trained jazz or rock bass players any day, as he comes with the kind of soul in his playing that they aspire towards. As a band, one thing that we often do in rehearsal and at gigs is play around with time signatures on tunes. One night, while playing a tune in 4/4, Eddie Ray decided to go into 6/8 while I went into 2/4 and Redbone stayed in 4/4. It's a math problem along the lines of solving equations and looking for the common denominator. With the use of technology and 'industry standards' the differential between a band's live show and their record has grown wider and wider. The standard for recording is that the music is turned into a matrix of time corrected loops sewn together. Steely Dan used to do a version of this pre-looping. For the studio version of the album, they'd record in California, with California studio musicians who are in the pocket and predictable. For the tour, they'd put together a band of east coast guys who are wild and unpredictable. James Brown had bands that could do both. 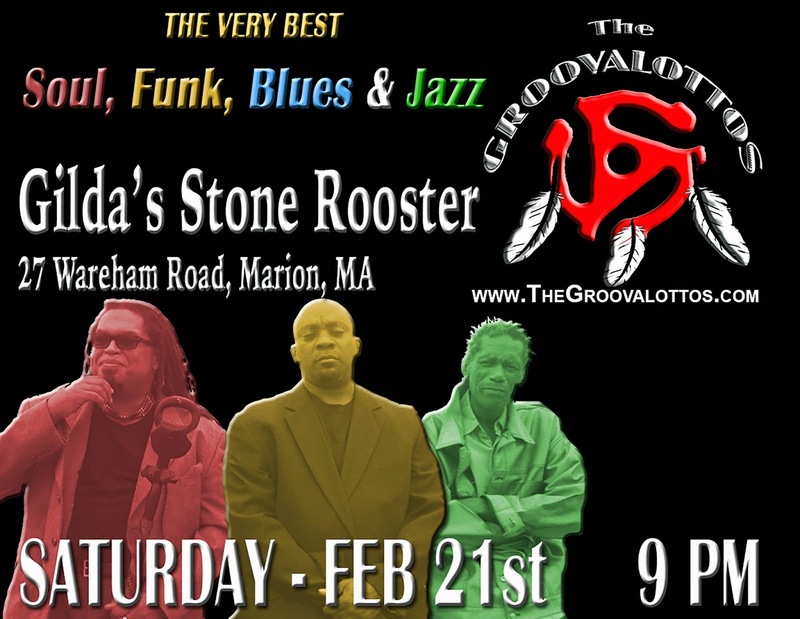 The same can be said for Sly and the Family Stone. 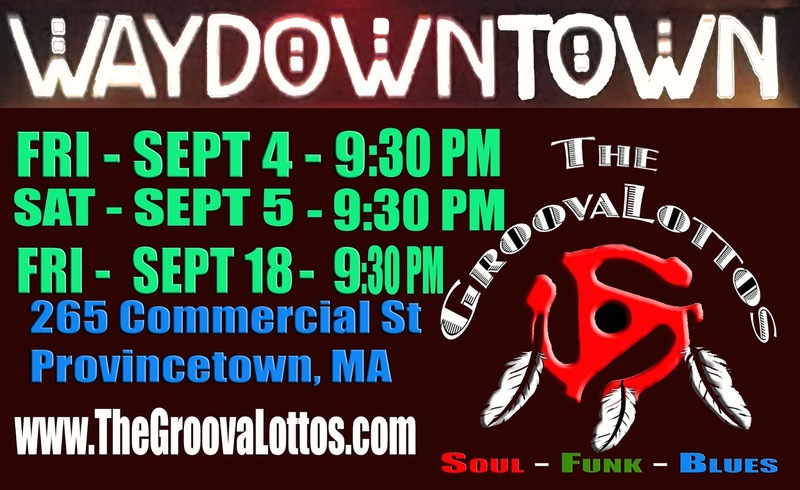 Also taking a page from Motown's studio band, they were all active jazz players who would record in the studio all day and play out at the clubs at night. 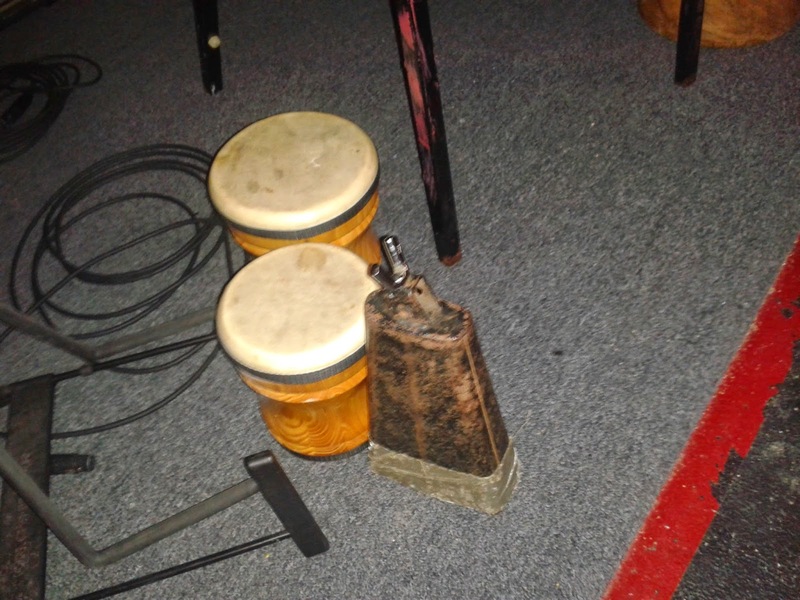 The jazz clubs provided them with an opportunity to experiment with grooves, feels, and chord voicing. Elements of these experiments would often find their way into the arrangements of the songs they'd record the next day. In gathering footage for our documentary, "The Song Keepers" we ended up collecting hours of footage of our live performances and audience reactions. Pin-pointing elements that made particular performances stand out and translating them to the studio was how we created our basic tracks. 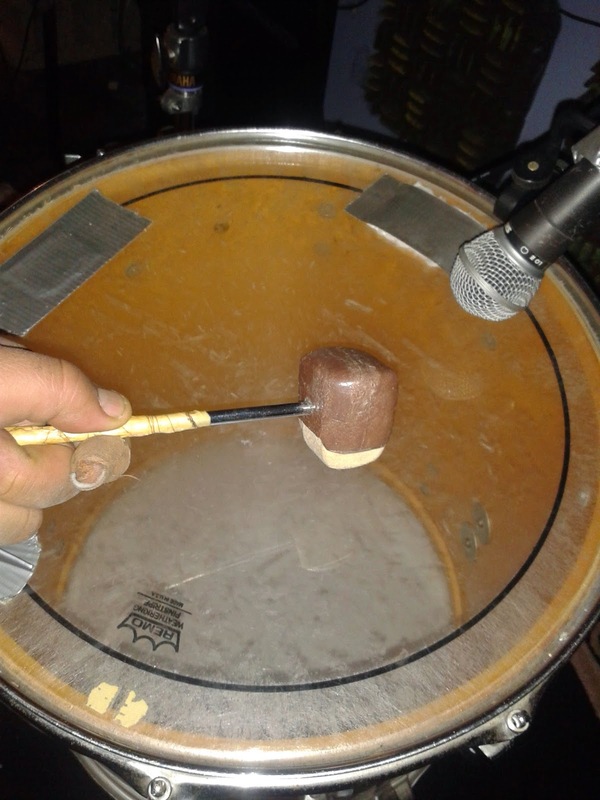 For any organic player, the studio can be a very restrictive environment. Most of my work as a producer has been trying to find ways to be organic in the studio, even when dealing with the electronica approaches of my last couple of albums. The production challenge here was getting Redbone to play like Redbone at a gig who can play in, out, next to, under, over, in front and behind the pocket naturally. Today, he was making the mistake of trying to lock himself to Eddie's kick drum. What I needed him to do was respond to it. 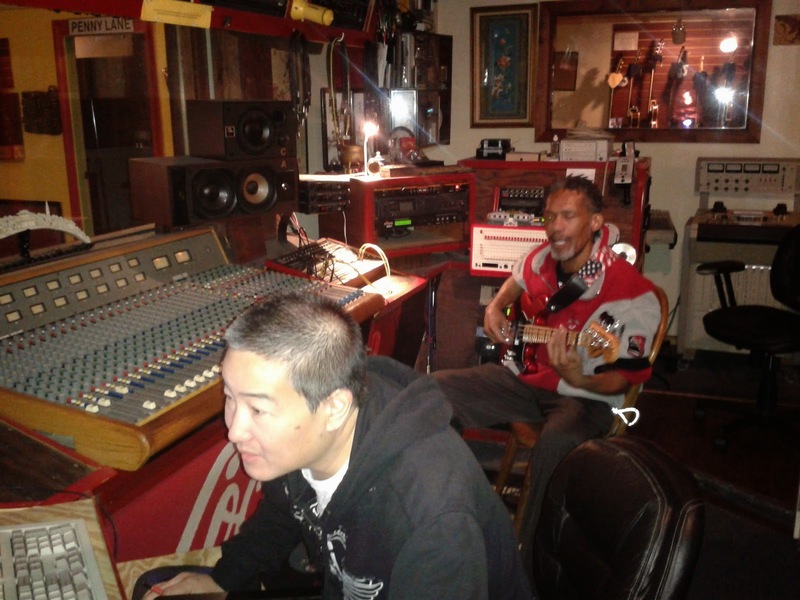 Since we were recording the bass DI, Redbone was able to sit in the control booth and record to the playback on the monitors instead of through headphones. I was able to sit behind him and be the annoying voice in his ear, coaching him through the bass parts. The end result: 12 of the best bass track recordings that I've heard in quite some time. "Ask Yo' Mama" is on it's way to being an instant classic album.